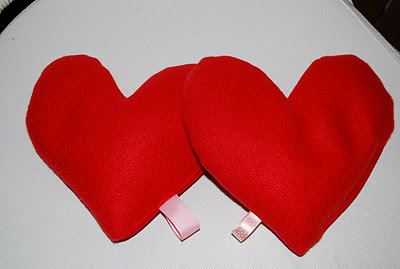 ' Heart Shaped Hand Warmer - Sisters, What! 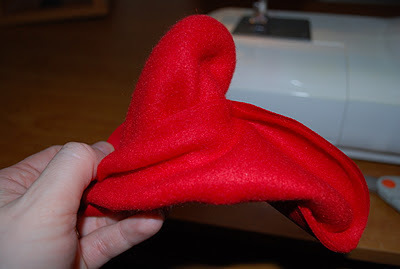 So back a while ago someone gave Zac a heart shapped hand warmer (he is in the heart business). Anyway I thought I could recreate one easy. So here goes my first tutorial. I thought it would be perfect for Valentines Day. Wouldn't one of these be a great gift for someone you love? *You could also use flannel for both front and back. 1. 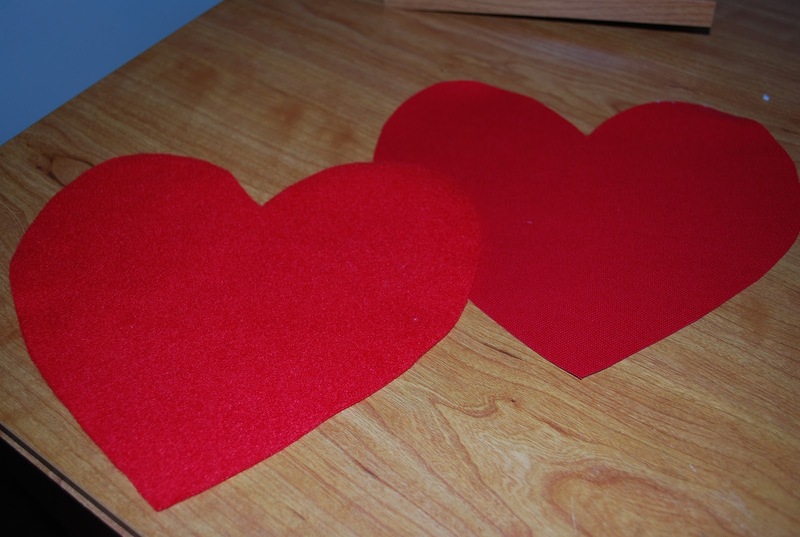 Cut out 1 heart from fleece and 1 heart from canvas. 2. 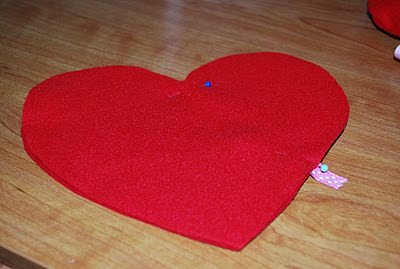 Pin canvas heart to fleece heart. 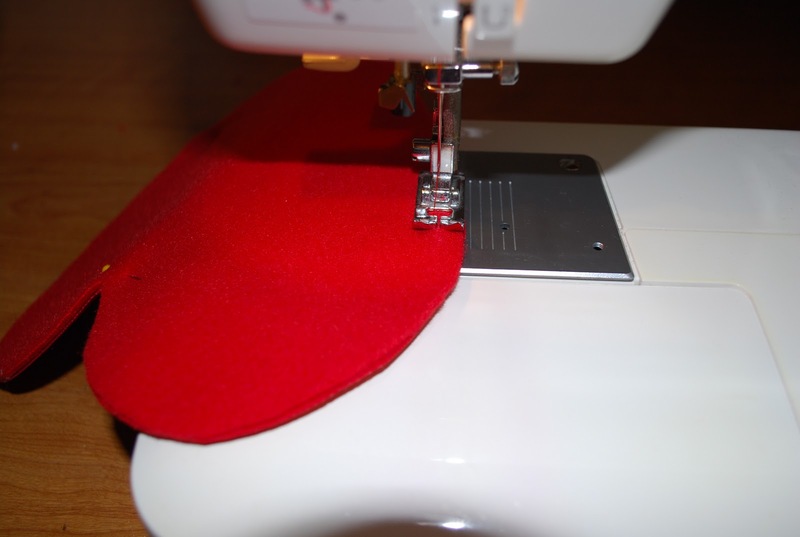 If you want a ribbon tag now is the time to pin it inbetween the two layers. 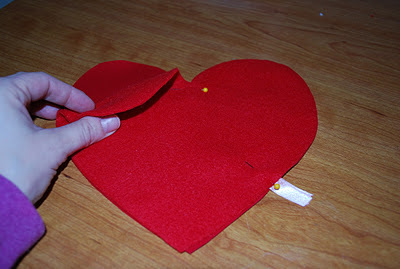 I also like to pin the heart together at the V of the heart. 3. 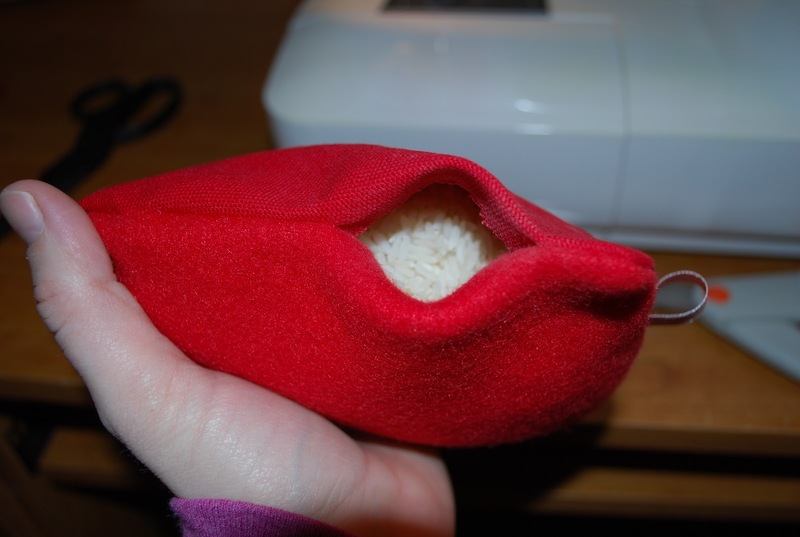 Sew heart together leaving a 2-3 inch whole for pouring the rice in. 4. 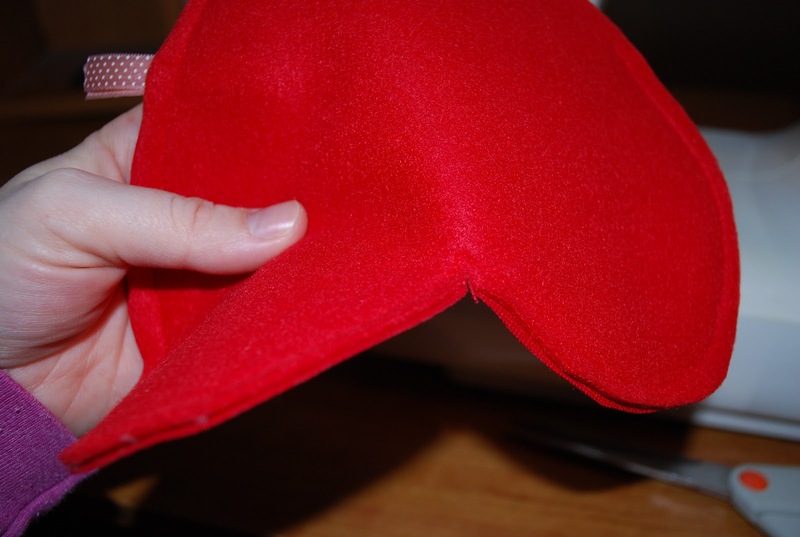 Trim the tip off the bottom of the heart so you can get a good point to your heart. 5. Cut a slit right between the V of the heart. Helps it turn better. 6. 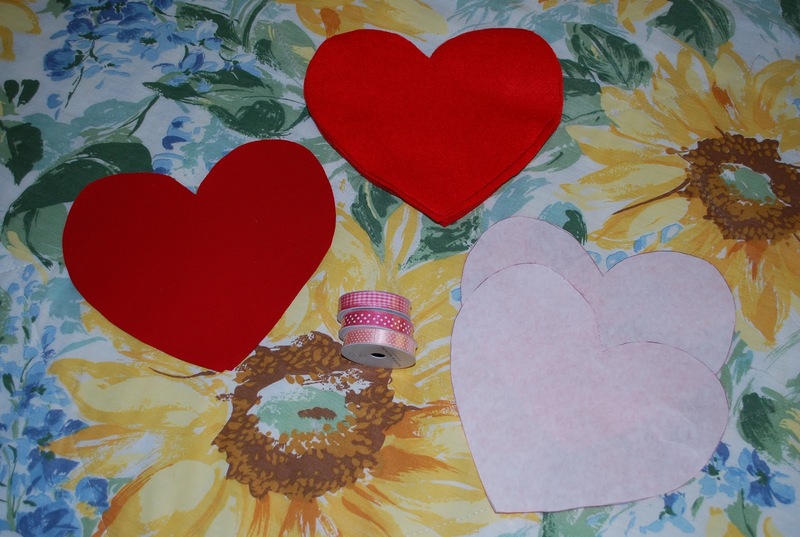 Turn the heart right side out. 8. Sew hole shut. Not as pretty as I like it but oh well. Now go throw that baby into the microwave for 1-2 minutes and warm your hands, feet or whatever! Enjoy. such a charming idea ! 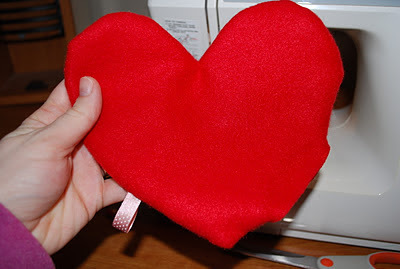 As I sit at my computer with one hand gripping a hot cup of tea to keep it warm, I am thinking these sweet little hearts would be very nice to make. 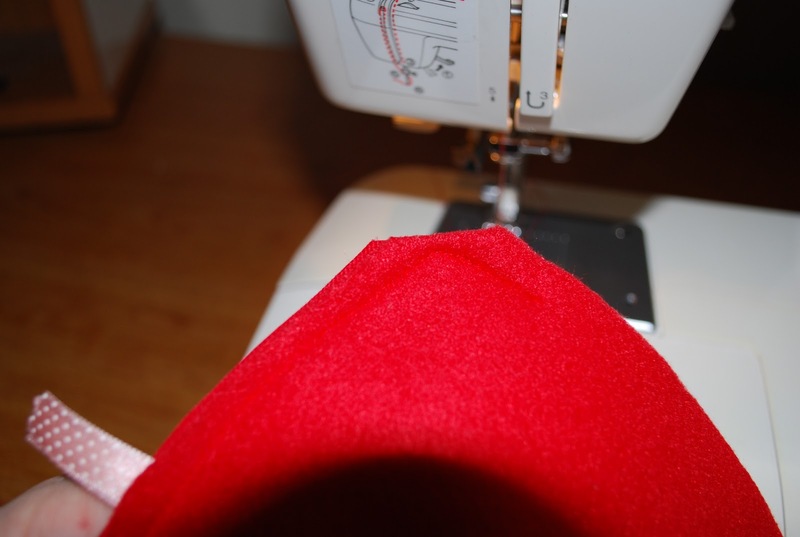 Your tutorial is great and your project turned out perfect! I have enjoyed popping in to visit with you! Great post. Hey, I just discovered your blog tonight and was excited to see how great it is. I just started a similar blog with my sisters and my mom. We nominated you guys for the Liebster Award, an award given by other bloggers to up and coming blogs that have less than 200 followers. We have a link to your blog in our post at createinspiremotivate.blogspot.com, and are trying to send some traffic your way. Come check our blog out, and then you can pass this award on to 5 of your favorite up and comers. LOVE this, how adorable !! Thanks for sharing, send over here from Jen at TT&J. Love your blog! Newest follower !! These are great. 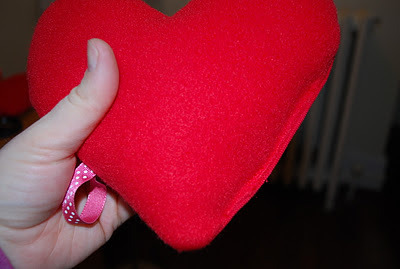 I made some of these recently using pink fleece - the kids use them for their pockets on cold mornings! Those are so adorable and sweet! I would love it if you would link up to my Valentines Party @ www.cheapcraftymama.com! Isn't it the handwarmer you should throw in the microwave, not "that baby?" I think this is just the sweetest idea! Bonnie and I would love it if you would share this at our link party! That is so cute! 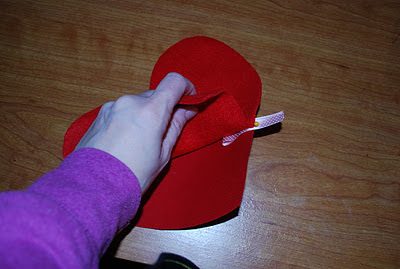 We have had so much fun with the Find Some Love Fest link up! It's so great to connect and support our fellow bloggers. We are following you and would love for you to visit our blog. These are fantastic. I can't imagine at the moment having to warm my hands or feet, as it's mid-summer, but I do remember so very cold days last winter where this would have come in very handy (bad un intended). Check out The Life of Clare for an earring giveaway.